The impact of the 2017 International Plowing Match (IPM) in Walton will now live on for the next quarter-century thanks to the creation of the new legacy fund. IPM Chair Jacquie Bishop says that by the time the legacy fund has been paid out, the match will have invested over $500,000 back into Huron County. The hope, though, is that the legacy fund will be something that lives on for longer than its planned 25 years. With Huron County historically hosting an IPM approximately every 20 years, Bishop said the hope is that it can be topped up by the next local IPM to create a lasting legacy for Huron County youth. The fund, Bishop explained in an interview with The Citizen, will be available to applicants entering their second, third or fourth year of post-secondary education, whether it be college, university or a trades school or apprenticeship. The IPM was always focused on the youth and the future of Ontario, Bishop said, and this legacy fund will be a way for the local match to invest in the county’s young people decades after the event was held. While some final details are left to be ironed out, Bishop says she expects the fund to accept its first applications this summer, with the bursaries being rolled out in the fall, perhaps at the Huron County Plowing Match or at one of the local fall fairs. The thinking behind the fund, Bishop said, was not only to leave a lasting legacy, but to help inspire the youth of Huron County for years to come. She said that the first year of post-secondary education is often planned for, but that bills can mount in the second year of a program, which is why IPM committee members structured the fund the way they did. The fund will be stocked with $250,000 to be distributed over the next 25 years. She said that the IPM corporation will soon be dissolved and the money will be handed over to the Huron Plowmen’s Association for safekeeping. For now, Bishop says that a three-person board of trustees has been established to review applications. Right now that consists of Bishop and IPM executive members Brian McGavin and Matt Townsend. That group, however, will rotate in the coming years, introducing new faces and bidding farewell to veteran ones. While members of the IPM executive couldn’t necessarily plan for the fund before the match was held, Bishop said some form of a legacy fund had been on the lips of members since the early stages of planning. She said that while one of the greatest legacies left by the IPM will be the over 220 barn quilts erected across the county, the fund will ensure a financial legacy that will help Huron County youth to better themselves for years to come, which is truly special. 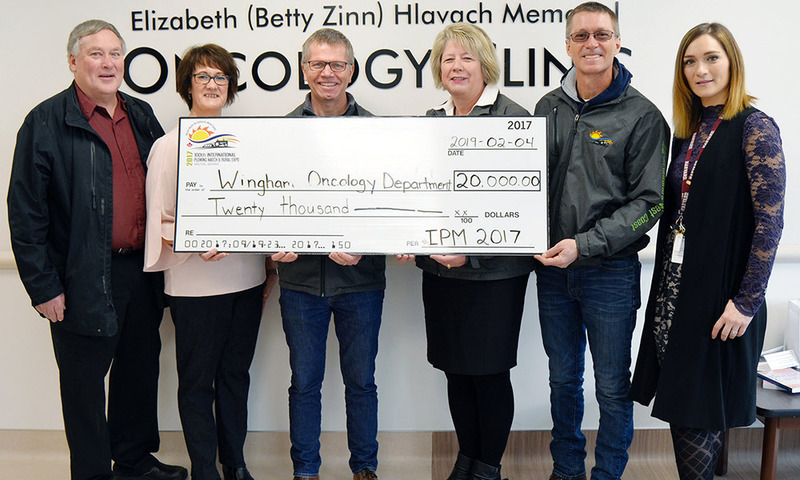 While the legacy fund alone will inject $250,000 into the community over the next quarter-century, members of the IPM executive have been back donating funds raised through the 2017 IPM to worthy county-wide causes this week after initial donations were rolled out last year. “We wanted to make one-time donations to four [non-profit organizations] that touch the lives of all Huron County residents,” Bishop said. The executive donated $20,000 to the Huron Residential Hospice late last month in Brussels, followed by further $20,000 donations to Jessica’s House hospice in Exeter, the Huron County Food Bank Distribution Centre and the Wingham and District Hospital’s new oncology unit. The Wingham donation, made on Monday, helped fund the unit’s kitchen area, which will now be named after the IPM. The food bank donation, Bishop said, fit with the IPM’s agricultural mandate in that it helped the centre to purchase a new refrigerated delivery truck to ensure that healthy, fresh food can be delivered to those in need, rather than preserved foods. This comes after the executive donated over $100,000 at the beginning of 2018 to 55 organizations. Funds were distributed to committee chairs in $2,000 portions to each committee to be donated to local organizations. In addition, over $40,000 was donated to local service clubs that volunteered at the event. The 2017 IPM was hamstrung by several inches of rain in just a few hours on its opening day and then a forced closure for its second day to allow for significant clean-up and site repairs, followed by days of unseasonable heat. However, despite those challenges, the event still welcomed over 76,000 attendees to Walton in, essentially, three days. Bishop said that the match made over $3.8 million in total revenue and, after all of the bills were paid, she and the rest of the executive have been very pleased to be able to donate over $500,000 back to the community that so supported the match. She says she was really overwhelmed with that sense of accomplishment and community pride on Jan. 25 when she and other executive members donated the first $20,000 cheque to the Huron Residential Hospice. With the event being held at the Four Winds Barn in Brussels, she said there were many familiar faces in the crowd, including host farmer Jack Ryan, so to be able to give back to the community has been very rewarding, she said.